When built into a Rich Task it is the kind of discussion that clarifies understanding, connects and applies knowledge, generates ideas, and evaluates conclusions. Teachers can facilitate Rich Talk by asking questions. HOWEVER, the nature of the questions will determine the 'richness' of the talk. What is the formula for the area of a rectangle? vs. What could be the next steps needed to solve this problem? 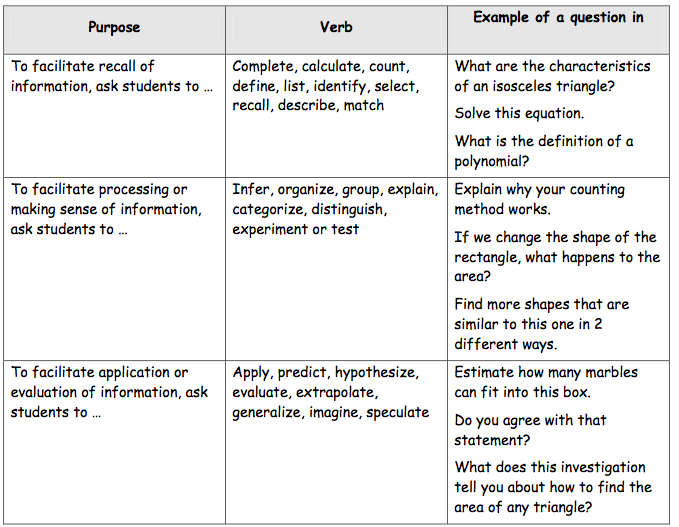 In the first question, students respond based on memorized information, where as the second question allows students to demonstrate different ways of being able to solve the problem. Activates student's thinking. Challenges them to process information, and then apply/evaluate it. Helps Students Learn to justify their own arguments, consider, evaluate and respectfully challenge the arguements of others. Promotes collaborative learning: Open-ended questions require students to consider multiple perspectives. These perspectives are built through peer discussions of questions.